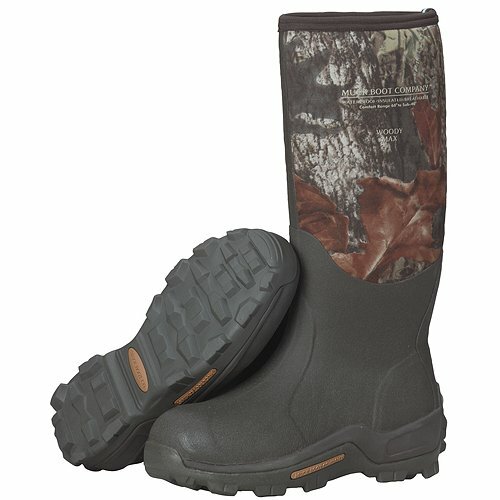 For optimal performance in extreme cold conditions, Muck Woodymax Rubber Insulated Women's Hunting Boots feature a warm fleece lining with 2mm thermal foam under the footbed for additional insulation from snowy terrain. Built with a women's-specific last, these insulated hunting boots have a slimmer fit that better suits the contours of female feet. An EVA midsole and 100% waterproof 5 mm-neoprene bootie offer additional flex and cushioning to absorb shocks and improve comfort during longer treks. The MS2 bobbed molded outsole of these women's rubber boots is designed to reduce weight while also improving stability for traversing uneven ground.